The most common protein powders on the market are made with whey or casein, both of which are dairy-derived. But if you have milk allergies, are vegan or just prefer to steer clear of dairy products, you have other options. Soy is a common vegan powder, and hemp, brown rice, or pea protein powders can all enhance your diet as well. Since dairy-free protein powders and prepared protein drinks contain such a variety of ingredients, always check product labels for accurate information before you buy. In general, however, you can expect that dairy-free protein powders won’t have quite as much protein per serving as whey or casein powders. One scoop of soy protein powder has about 180 calories and 21 grams of protein. A scoop of hemp powder has about 135 calories and 15 grams of protein. The same amount of brown rice powder has 110 calories and 15 grams of protein, and that amount of pea protein powder has 130 calories and 28 grams of protein. Whey protein powder has been scientifically shown to help some people gain lean muscle mass and lose body fat. In a study published in 2006 in the “International Journal of Sport Nutrition & Exercise Metabolism,” researchers concluded that soy protein also stimulates muscle mass and strength gains when combined with resistance training. Evidence published in 2013 in the “Journal of Women & Aging,” shows that soy protein isolate significantly improves bone strength and bone health when combined with exercise. 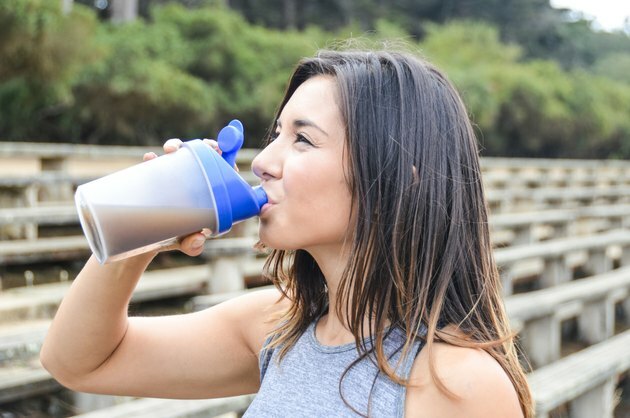 Using any type of protein powder as an occasional meal replacement also has the potential to encourage steady weight loss because protein is more satiating than fats or carbohydrates, so it may curb hunger and reduce your overall calorie consumption. Any protein supplement, regardless of whether it contains dairy or not, is likely to provide inferior nutrition to whole foods. That’s because processed supplements are isolated forms of nutrients and aren’t able to replicate the healthful fiber, antioxidants, phytonutrients and other protective substances that are present in natural foods. And while soy is a complete protein -- meaning it offers all essential amino acids -- hemp, brown rice and pea proteins are not complete, so you may need to combine them with other protein sources for the best nutrition. In some studies, significant consumption of soy protein has been linked to cancer, irregular heartbeat or heart disease. Other studies posit that soy protein helps prevent cancer and heart disease. The conflicting research may spur you to seek hemp, rice or pea powder, but those supplements are usually not as concentrated and are more difficult for your body to absorb successfully. All powders have pros and cons, so if you’re considering adding one to your diet, talk it over with your doctor first.